Death’s remastered version of “Baptized In Blood” is available to stream, via Loudwire. This version of the song will be on the deluxe reissue of their 1987 album “Scream Bloody Gore”, which will be released on May 20, via Relapse Records. Death’s 1987 album “Scream Bloody Gore” will receive a deluxe reissue on May 20, via Relapse Records. The effort was remastered by Alan Douches (Death, Mastodon), and it will also feature previously unreleased recordings, unreleased demos, and special liner notes from Chris Reifert (ex-Death), Max Cavalera (Soulfly, ex-Sepultura, etc.) and producer Randy Burns. It will be available on a two-CD set, a limited edition three-CD, vinyl, and a deluxe double vinyl box set and cassette. A limited edition bobblehead, made by Aggronautix, will also be available, and will feature the cover art (limited to 1000). You can check out the remastered version of “Zombie Ritual,” along with the track listing below, and can preorder the release HERE. The first part of the Death DTA European tour has been rescheduled due to Steve Digiorgoio’s and Gene Hoglan’s commitments to Testament. 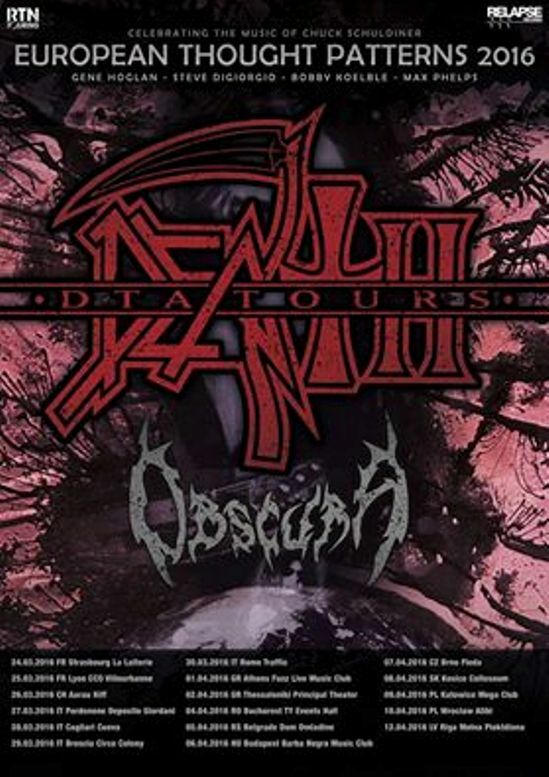 Obscura will still serve as support, but won’t play the final dates. Death DTA, featuring Steve DiGiorgio (Death, Testament), Gene Hoglan (Death, Testament, Dark Angel), Bobby Koelble (Death), and Max Phelps (Exist), will be performing Death’s Individual Thought Patterns in its entirety during a 2016 European tour. The band will also be joined by special guests Obscura. 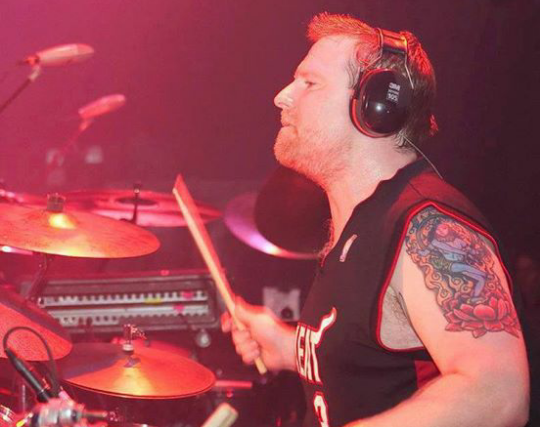 Sean Reinert has dropped off the current Death (DTA) Tour, due to health reasons. 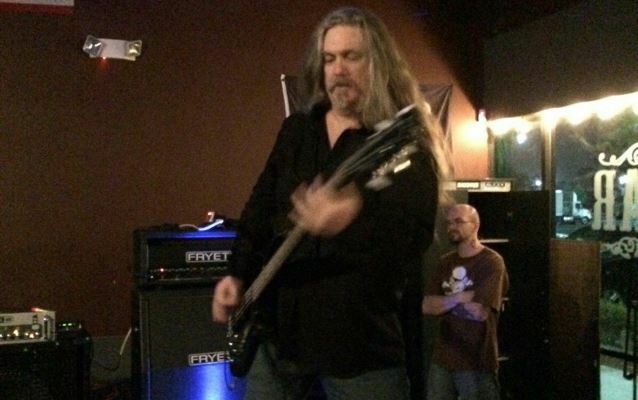 In his absence, Gene Hoglan (ex-Death, Testament etc.) will be taking over drumming duties. I was going to issue this statement today but it looks like the cat’s already been let out of the bag and people are drawing some crazy conclusions. So let me address what is going on with the tour change. Yes, it is with great regret that I left the DTA tour after the San Francisco show Sunday night. Although I have spent weeks rehearsing for this tour and was very excited to put on great performances, it was not meant to be. For the past six months I have been suffering from lower back spasms, extreme muscle fatigue and limited grip strength. It’s no big secret that after over the last two years and two major surgeries (full achilles repair on my right ankle and a year later knee surgery on my left knee for a torn MCL) that I’ve gained a lot of weight due to recovery and pain. All of this culminated in the perfect storm. I realized that the situation was not getting better the more I played. Shortening the set was not something that I felt was fair to the fans and after three shows I realized the best thing for the tour was to get Gene in the fold and for me to get some definitive answers. Fortunately, Gene is available to take over for me starting tonight in Seattle. He is of course a f*‪#‎king‬ beast behind the kit and there’s no one better to fill in for me. I have already consulted with my Physician and will have a series of tests over the next few weeks to check for for everything from carpal/cubital tunnel syndrome to other possible nerve/spinal/back issues. I am sorry to the many fans who were looking forward to seeing me play this tour and I hope to make it up to you in the future. Death To All (Death DTA Tours), the tribute band featuring ex-Death members Steve Di Giorgio, Bobby Koelble, and Sean Reinert, with Cynic’s Max Phelps on vocals, will be setting out on the Swamp Leper Stomp North American Tour this Fall. 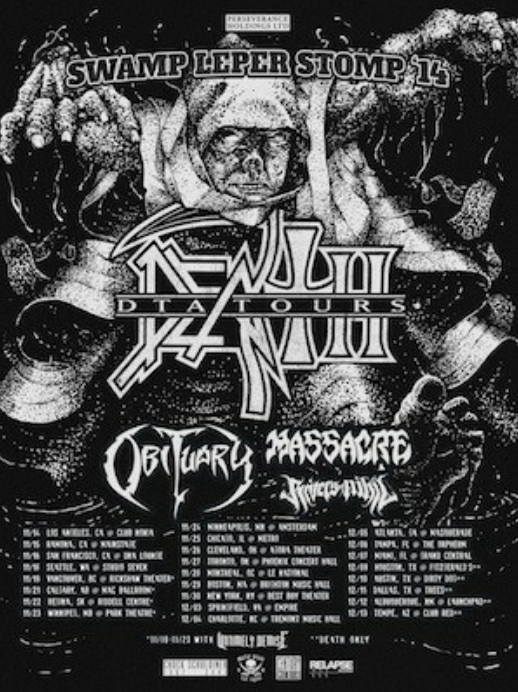 The band, which tours to honor Chuck Schuldiner, will also be joined by Obituary, Massacre, Rivers of Nihil and Untimely Demise!. Comments Off on Death To All (Death DTA Tours) Announce Swamp Leper Stomp 2014 Tour Posted in Death, Death DTA Tours Tagged Bobby Koelble, Chuck Schuldiner, death, Death DTA Tours, Massacre, Max Phelps, Metal, Obituary, Rivers of Nihil, Sean Reinert, Steve Di Giorgio, Swamp Leper Stomp, Tour, Untimely Demise!